Joe Colombo died 49 years ago when he was only 41. In only 10 years, he designed an enormous number of objects, including entire residential machines, some of his furniture are still in production, and the old originals are traded like financial investments. His best-known piece is the „Elda Chair“, named after his wife and designed 1963. The armchair consists of a fiberglass shell standing on a rotatable, invisible base and is upholstered with thick leather beads. Slight signs of wear on the shell, the lacquered leather shows heavy wear. 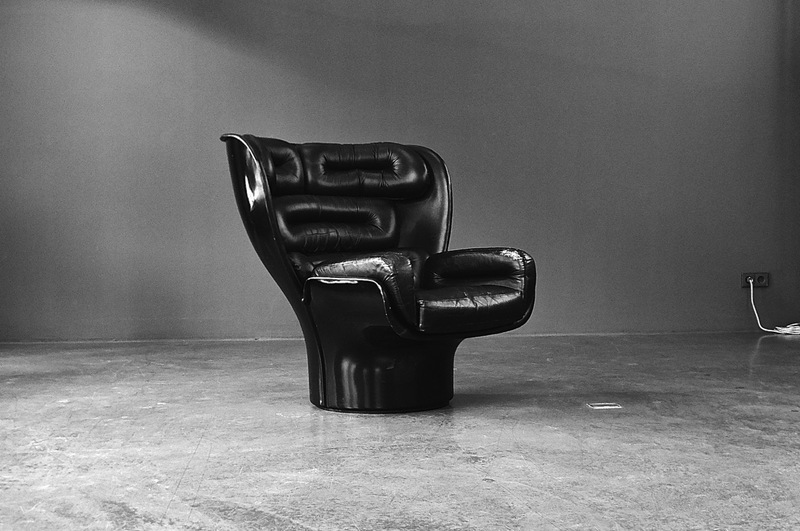 Our current Elda Chair comes in black/black and was produced in early 1970. The black leather is lacquered and shows clear patina, but has no cracks or holes. The shell also shows signs of age-related wear, but the functionality is 100% given, as is the seating comfort.